I found your nose exercise page this morning. Cannot wait to try them. Are there exercises for my crooked nose? Picture attached. SEE NOSE EXERCISES TO SEE THE PAGE SHE IS TALKING ABOUT. Is it the bone or cartilage that is crooked or just the muscles that are imbalanced? Usually it is just the muscles that are imbalanced (one set of muscles on one side is stronger than the other). However if you've suffered and injury to your nose (such as being punched there really hard) it could be the bone or cartilage that is the problem. If you feel the bone with your fingers in the top of your nose and anything feels off centre, you will know which it is. 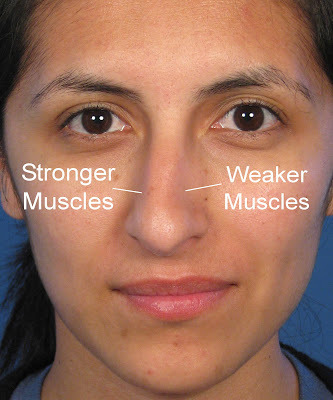 With crooked noses its usually the nose tip area which is crooked, which means it is the muscles that are too strong on one side and too weak on the other. So what you need to do is "equalization exercises" to correct those muscles. It is a bit like weightlifting / resistance training for your nose. #1. Squinting the Nose <-- This is the really important one for fixing a crooked nose, although the others help too to keep things "balanced". And nose wiggling wouldn't hurt either. Do #1 twice per day, #3 and #4 once per day, nose wiggling will help too, although that is easier to do with a mirror. Keep doing all of them every day for a month and you should start to see results. Keep doing that for several months and the nose muscles on each side should balance themselves out. Note: If you underwent nose surgery very recently I would wait 2 weeks before starting the exercises. Your nose will need time to heal first. Want to learn more on this topic? Visit the NOSE EXERCISES post. I am getting a lot of requests from people wanting personalized advice about their nose and what nose exercises they should do, how often they should do them, special circumstances, etc. My advice is to follow the instructions listed above and on other posts I have made about nose exercises. If you are contacting me asking me for personalized help - basically asking for my services in aiding you with your nose exercises, then I will need to charge you my personal training rate ($50 per hour) for my services. I know this is not the answer many of you are looking for. I have already answered many of the frequently asked questions in the comments section of various nose exercise posts, and answered many emails from people asking for help with their nose exercises - but I am a busy person and the emails have reached a point where I need to start charging for this service because I cannot answer all of them. Best of luck with your nose exercises! Maybe. I charge $50 per hour for personalized help however.